An espresso pod machine is similar to a normal espresso machine but it can be a little bit quicker to get your shot of espresso out. The reason is because you put “pods” into the machine (they can look like individual coffee creamer containers), a hole is punctured, hot water is run through, and you have espresso in your cup. This could also be great for when you have guests over as it can be less intimidating to operate. When looking for the best espresso machine, you may want to think about a pod machine. Below are reviews of the best espresso pod machine options to help you make a decision. What are espresso pods and what is the advantage of a pod brewer over a traditional espresso machine? An espresso pod, also known as an Easy Serving Espresso Pod (E.S.E. for short) is a small compact coffee disc with a paper filter covering (source). Each pod contains approximately seven grams of coffee, compressed. The pod is placed into the pod adapter of a normal espresso machine. The original use for them was in the office where it was less time consuming for staff compared to preparing espresso themselves. They were then later introduced into the home and even in restaurants as an easy way to pull a shot of espresso as many people in restaurants, or even in the home, didn’t have barista training. Believe it or not, it’s can actually be quite complicated to brew a shot of espresso. A coffee pod brewer allows you to brew from a pod with a push of a button. A traditional espresso machine requires you to grind the coffee yourself (often with an expensive burr grinder), you have to use a tamper to compact the grounds, you have to grind them fine enough but not too fine, and you have to get the settings correct on the espresso machine which can be a combination of pressure and water temperature. The baristas at Starbucks make it look easy, but many baristas aren’t even good at making real espresso. In fact, there are entire barista schools that educate on how to property brew espresso, so it’s really not that straightforward. This is why coffee pod brewers are alluring. The E.S.E design as we know it today was created by illy which remains one of the most well-known pod producers. The E.S.E. design is more of a standard for companies that produce their own pods so that they can be used by many machines, although some espresso pod machines is only compatible with one brand of pod so that is something to look out for. While pods have their disadvantages such as a high cost, they do allow for a high degree of consistency when brewing espresso. They can be great for the office, at home when you don’t want to master the art of grinding your own beans, and can add a lot of variety to the flavor of your cappuccinos and lattes. After learning about espresso pods and capsules, you still may be in the dark as to whether you’d rather use the capsules or buy a machine that strictly (or also) can brew from coffee grounds. The great thing is that if you want to brew the perfect cup of coffee at home or in the office, you have numerous options! Some machines even accommodate pods AND coffee grounds! The biggest selling point to using ESE pods is their sheer convenience in your fast-paced life. Even though espresso, cappuccinos and lattes are delicious, preparing them by hand is time-consuming despite how it looks at Starbucks. It is a skill that can take time to refine as you need to deal with calibrating the grinder, finding the perfect roast of coffee (or trying to roast it yourself), trying to find the perfect grind at a store (it’s easy to grind it too fine or too coarse), and it’s just not for some people. ESE pods are pre-tampered, pre-dosed and they’re a “plug and play” solution. Once used up, you simply need to throw it in the garbage as you would a teabag. If you get an espresso machine that isn’t compatible with ESE pods, only coffee grounds, then you’ll never have the option to use pods. If you’re unsure which you would rather have, you may want a machine that does both. Some people LOVE certain ESE pods and couldn’t imagine drinking anything else, and in that case, a strict ESE-compatible machine may be the way to go. That said, let’s go over what the best espresso machines are that are compatible with coffee pods! The Philips Saeco Poemia Top Espresso Machine is great if you’re looking for the versatility of using both ground coffee and ESE pods. 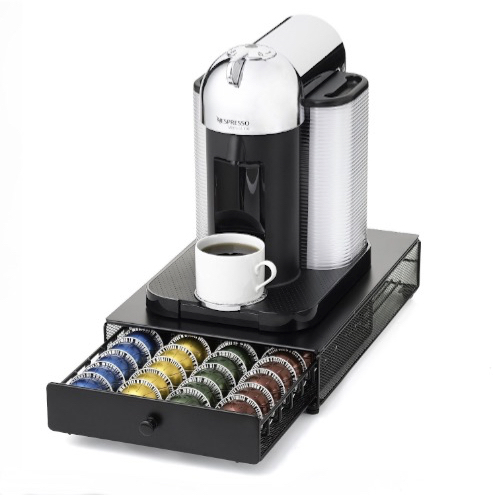 Philips Saeco is a well-known, highly-trusted brand in the coffee community, so this would be a great purchase. It is housed in stainless steel, has a powerful 15 bar pump, and a pressurized crema portafilter for the perfect cup of espresso. The portafilter has an ESE adapter so that you can brew from the pods directly which is a great feature to have for those that like the convenience of pods. It also comes with an attached milk frother and light indicators for when the machine is ready to brew espresso and also when it is ready to steam. The frothing tip can easily be removed for cleanings. 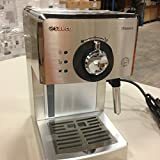 A few other features that make this espresso machine a winner include the removable water tank, and ergonomic and compact design, a cup warmer, and its one year warranty from the time of purchase. This is a great espresso maker on a budget. I previously got a De’Longhi Retro and returned it after a week of fighting to get decent espresso. I tried many kinds of tamping and grounding techniques. The Poemia is a much higher quality machine. The key is that the portafilter is pressurized and there is no need to tamp the coffee grounds precisely. There is a valve that automatically opens when the pressure is optimal for brewing. The espresso comes out with great crema. 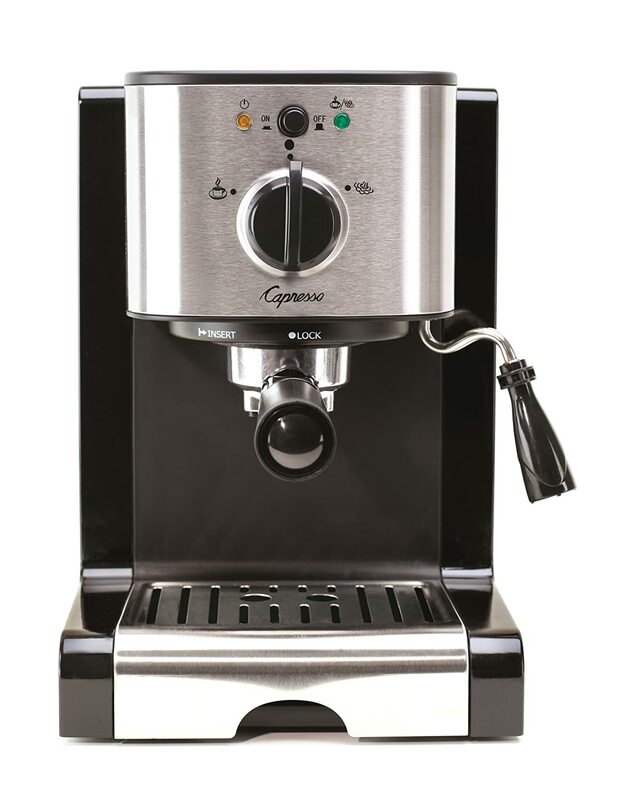 The Capresso Pump Espresso and Cappuccino Machine is another great all-around espresso machine for seasoned baristas or entry-level espresso lovers. You get the perks of being able to use your own coffee grounds or ESE pods from the brand of your choice. Some of the features of this espresso machine include the ability to brew a single or double serving of espresso, has a heated plate to keep your cup warm, has a milk frother that can either froth or steam (depending on whether you want a latte or a cappuccino), has a 48-ounce water tank, light indicators alerting you when the machine is ready to brew or froth, and is backed by a one-year warranty. This espresso machine doesn’t have numerous great reviews because it’s bad… the machine is great and would probably be a great low-cost investment for any household! I purchased this machine based on a recommendation of a close friend. He’s made me coffee from his, while visiting his home. It heats up fast, and makes a good coffee. It’s a small machine, basic, no frills, etc. However, it serves its purpose quite well. As I said, it heats up fast and takes up little counter space. I actually use this at my office. 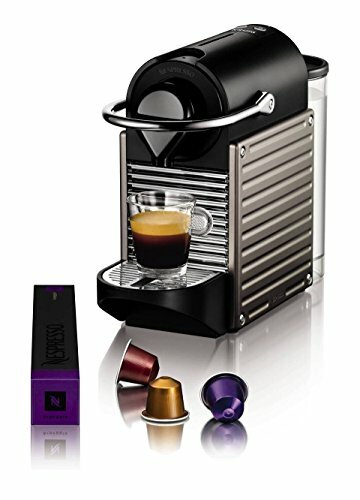 The Nespresso Pixie Espresso Maker is one of the most popular pod espresso machines. These don’t take just any ESE pods but take strictly Nespresso pods which would be a negative for some folks. Nespresso does have a large variety of flavor to please different taste buds. This espresso machine is extremely compact which means that it leaves a small footprint in either the home or the office. You can brew two different amounts of espresso, it has a cup warmer, has a 24-ounce water container with a low level light indicator and can hold up to 10 capsules at a time. If you go with this machine, you’ll be able to order coffee pods from Nespresso 24/7. Best of all, you will receive a 16-ounce Nespresso pod sampler pack with the machine, and the espresso machine also comes with a 1-year warranty. This is truly a great all-around machine for the home or office, and can be great for entry-level home baristas. We purchased the Nespresso Pixie and have used it for about a year. The machine is great for its price. The Nepresso pods aren’t cheap, but at least have a lot of consistency. The water capacity is perfect and the machine is very compact. The waste container for used pods is a bit small, and not terribly well constructed. The auto-shutoff works well and the machine comes to temperature quickly. Overall, this is an excellent purchase if you want a small machine that makes espresso with very little mess in a very small machine.